COLOR(S): White & black, white & orange, white & lemon, white & light brown or tricolor. Some speckling on coats. The English Setter is one of the oldest breeds of gun dogs. 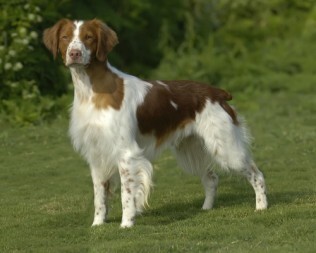 It is a beautiful, graceful, elegant, slim setter with a unique speckled coat. It thieves on human companionship or with other dogs. It has unconditional devotion to its whole family. This breed is very gentle, placid, affectionate and friendly. Newborn puppies are born white and after the first week begin to change in color. The English Setter is mild mannered and sensitive. This breed is extremely loyal, patient and devoted to its family. It makes a perfect family dog. It is excellent with children. The English Setter needs lots of companionship and enjoys playing with other dogs. Consistent training and strenuous exercise is needed for a good-natured dog. It is responsive and easy to train but does have a mind of its own. Training should start early to prevent development of bad habits, but should never be harshly treated. It tends to be willful and can be difficult to housebreak. It likes to roam, dig and jump. The English Setter is an adequate watchdog. There are two types of English Setter: field and show. The field type is generally a bit smaller and lighter, and very active so it needs more exercise than the show type. Both types need daily exercise to stay healthy and happy. The English Setter is usually enthusiastic and lively outdoors, but relatively inactive indoors. It tends to be quite vocal and can become a nuisance barker if not discouraged at an early age. It may drool, although not obsessively like some of the Mastiff type dogs. The English Setter's talents include hunting, tracking, retrieving, pointing, watchdogging and agility. The coat is short, straight and dense. Regular brushing and combing of the soft, flat, medium-length coat is all that is required to keep it in excellent condition. It is important to check for burrs and tangles, and to give extra care when the dog is shedding. Bathe or dry shampoo only when necessary. Trim the hair on the bottom of the feet and clip the nails. This breed is an average shedder. Unfortunately, English Setters are prone to an inherited tendency of blindness. The whiter variety has more risk of developing allergies, skin conditions, and hip and elbow dysplasia. Other health concerns include hypothyroidism and deafness. English Setters require long daily walks or free space to run. English Setters are a good companion to run along side a bicycle. Feed two or three small meals a day, as they are prone to bloating. Consistent training and strenuous exercise is needed for a good-natured dog. They are moderately easy to train, but do have a mind of their own. Harsh training is not acceptable with this breed, as they are very sensitive. They may not obey a command they understand because they are in fear of disappointing or failing their master. Positive reinforcement is the best method for this breed.